Growing up, I lived in the same zip code as the most famous old-fashioned ice cream store in Bangkok, ไอศครีมทิพย์รส, that, for more than four decades, have sold all kinds of Thai-style ice cream, the most popular of which is the fresh coconut milk ice cream (ไอศครีมกะทิสด). Every time our whole clan got together, we ordered from them by a truckload. This mildly-sweet gelato is as close as it gets to that Thai-style coconut ice cream of my childhood. The texture is silky smooth and creamy. It never develops icy crystals and scoops easily right out of the freezer. I don’t remember which of my aunts came up with this recipe, but it has been with us since before I was born. It is a gelato, really. No eggs are involved. No need to make a crème anglaise base. Mix. Heat. Stir. Cool. Churn. Freeze. Eat. Don’t you just love that? Mix everything together in a medium saucepan. Bring the mixture to a very gentle boil over medium-high heat, whisking occasionally. Once the sugar and gelatin have dissolved (no need to boil), remove from heat and let cool completely over an ice bath. Churn in an ice cream maker according to the manufacturer’s instructions. Freeze for 3-4 hours. Serve Thai-style with roasted peanuts or your favorite toppings. Mmmm…I don’t care how cold it is right now. I’d love some is this right now. Coconut milk equals delicious goodness. Coconut ice-cream makes people happy! Your gelato cheers me up! Wow, this gelato sounds super silky and delicious! Would love to try ! Oh yum! I love Mexican coconut ice cream, but this sounds so much better because I can make it myself! ooo silky smooth and deilcious! Go for it, QS. It’s worth it. 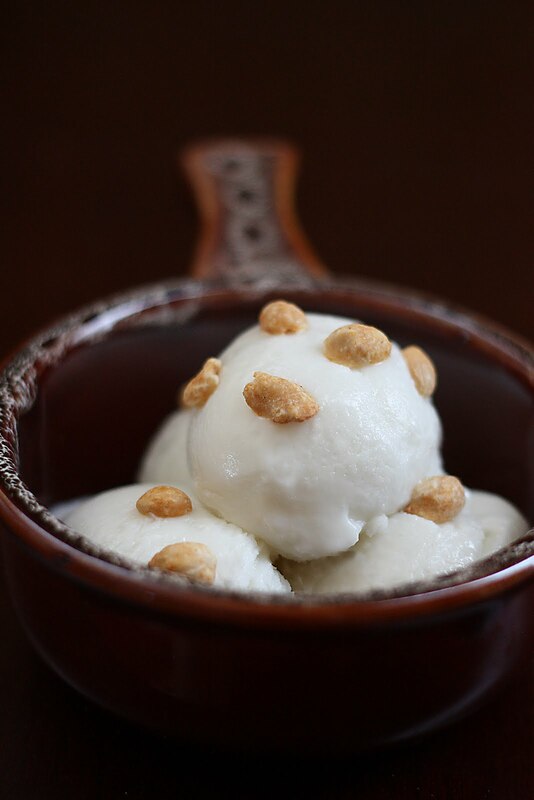 Smack dab in the middle of winter, I want a bowl of cool coconut milk gelato! I’m so glad I can find Chaokoh brand – I recall the post about your preferred coconut milk. Oh my, if I had not just squeezed some blood oranges for sorbet, I know what I’d be making for dessert. This looks wonderful, thanks so much for the inspiration. I may have to make it later this weekend. Thanks for the inspiration. I would like to try out this recipe as my good friend loves coconut ice-cream. Is non-fat dry milk the same as milk powder? Thanks for sharing. Purplegirl – Can’t verify whether that is true everywhere in the world, but at least in the US, nonfat milk powder is generally referred to as milk powder. But even if the dry milk powder you use is not nonfat, I think it’s fine. The idea is to increase the milk solid concentration to boost creaminess and prevent iciness. I’ve tried making it and it came out so delicious. It reminds me of the taste when I was at that Ice cream shop in Bangkok. I used Aroy-D coconut milk. I used to always buy Chaokoh but lately I’ve been buying Aroy-D because it has no stabilizers. The next time I make this I’m going to go to a Thai grocery nearby that I just learned about because their fresh coconut milk is highly recommended. It will be soon because this batch is not going to last long! Made this yesterday and got to eat it today after ripening it overnight. Quite amazing-rich, creamy and totally coconutty. I’ll definitely make this again – it’s super easy. The peanuts as topping add a great texture/flavor contrast. Can’t wait to try other recipes on your site! Thanks. Just got your book for Father’s Day and I’m making two new things (curry noodles with chicken and mushroom/oyster sauce stir fry) tonight for guests–that’s how much faith I have in you!! 🙂 Absolutely love your blog and, having grown up in Thailand myself, it’s my go-to website whenever I cook Thai. I really want to try your ice-cream but I have a dairy-sensitivity. Any possible substitute for the nonfat milk powder? No, not that I know of. Sorry. Nonfat milk powder provides the protein needed in this recipe to achieve the desired texture. To make this recipe dairy-free, subbing out one ingredient just won’t do; the entire recipe needs to be reformulated. Hi what is non fat dry milk? Is that a powder or fresh milk in a bottle?